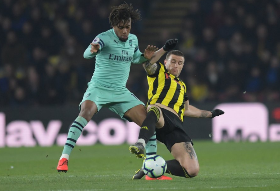 Alex Iwobi was in action for 90 minutes on Monday night as Arsenal defeated Watford 1-0 at Vicarage Road to move into fourth place in the Premier League table and boost their UEFA Champions League hopes. As usual most notable media organizations with interest in the Premier League rated the players after the game and allnigeriasoccer.com presents the assessments of the Nigerian by a selected few. PainintheArsenal. com handed Iwobi a 7/10 and acknowledged that he was the most creative on the night. "Created seven chances. No player created more than two all match. That is sensational going. "Admittedly, there are some unconvincing moments when his lack of purpose and muddled decision-making get the better of him, but Iwobi's effectiveness cannot be denied. The best attacking player on the pitch, even if it looks awkward at times." Football. London.com also hailed the impressive displays of the Nigerian. "Alex Iwobi: It was that same old story with Iwobi, so devastating carrying the ball forward and combining with others but so lacking in conviction when chances came his way. "There were moments when he was entitled to be frustrated at his team-mates poor finishing too, particularly when Mkhitaryan wasted the second half's best chance. ESPN.com deemed 7 out of 10 a better rating for the nimble footed Gunner. "MF Alex Iwobi, 7 -- In the first half, the Nigerian almost created a second goal for Aubameyang with a low cross and had an effort at goal tipped over. Iwobi is expected to play some part in Arsenal's Europa League quarterfinals, second leg clash against Napoli on Thursday.